Smartwool's Light Hiking Kids' Crew Sock is in it for the long haul. 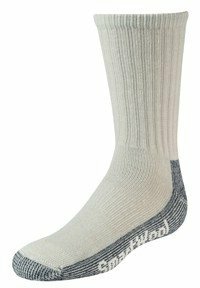 Ideal for long hikes, these socks have a reinforced sole that will stand the test of time. Smartwool knits the arch brace with spandex to give your kids' feet the extra support they need. Flat-knit toe seams won't rub their piggies raw after a long day on the trail and their young skin will stay blister free thanks to this Hiking Crew Sock's light half cushion.